"Mount Bullion Cal. 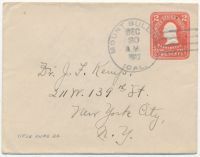 Dec. 30 A.M. 1912" duplexÂ postmark with four bars on 2c carmine postal entire Hartford issue (#U385) to New York City. 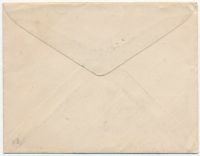 This is a scarce size envelope; USPS Knife 84. Mount Bullion in Mariposa County, CA is a discontinued post office that wasÂ in operation from 1862 to 1955. The townÂ was first named La Mineta (for little mine). Then it was called Princeton for the Princeton Mine nearby. Finally, the name Mount Bullion was applied in honor of Senator Thomas Hart Benton, whose nickname was "Old Bullion" due to his fiscal policies.